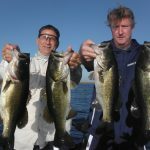 www.okeechobeejust4bass was fishing with long time friend Sean Flynn and his buddy Tony Lilly form West Palm Beach today. This was a 4 hour charter using Wild Shiners with over 40 fish caught. Here is a picture of some of the fish we caught today.